Banks continue to be challenged by disintermediation from telco’s and here is another example, this time in Japan. The service will launch 21st July, and allow sending up to $200 with only the payee’s phone number being required. An interesting tweak is the ability to have the money deposited with DOCOMO under the guise of a credit to your account, however this is deposit taking by another name. 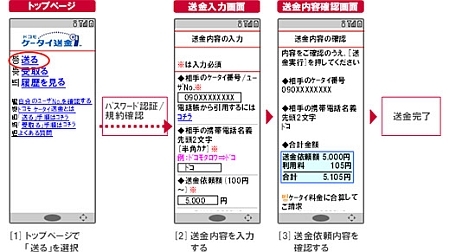 Customers of DOCOMO’s i-mode™ mobile Internet service on the FOMA™ 3G network will be able to remit up to 20,000 yen (about 208 U.S. dollars) per transfer, basically just by inputting the payee’s mobile phone number. The payee receives a mail notification via their DOCOMO mobile phone and is given the option of depositing the money in a domestic bank account or having the amount credited to their monthly DOCOMO phone bill. The payee can receive remittances totaling up to 200,000 yen (about 2,080 U.S. dollars) per month. It is a lucrative service with charges to payor and payee. The charges per payment (including consumption tax) will be 105 yen for the payer and 65 yen for the payee.